A big hello to all of my cherished programming friends from SXSW2007! It’s Andy Gesner and the first class staff from HIP Video Promo, thrilled as always to be bringing you the latest video from our friends at Drive-Thru Records. You surely remember the last few Drive-Thru clips we sent you – Hellogoodbye’s “(Here) In Your Arms”, Halifax’s unapologetic “Our Revolution” and The Early November’s hallucinatory short for “Hair”, which set the band adrift in a constantly shifting, phantasmagoric version of suburbia. Self Against City appeared at this year’s SXSW with The Early November, and they share plenty with their labelmates: an emphasis on tight song construction, spirited performances, and a lush, gigantic guitar sound. And for their lead single, they’ve come up with a video that is even trippier than the “Hair” clip, even as it plays with many of the same tropes (small-town confinement, deadening work environments, rock and roll as an illusory form of transcendence). The “Becoming A Monster” video opens in a drab, old-school corporate office – the walls are institution green, the desks are Seventies brown, and the workers are outfitted with pens, lamps, and cheap electric typewriters. Dressed in white suits, the members of Self Against City sit at their cramped stations and fiddle with their analog tools. The song doesn’t start, though, until one of the workers shoves a plug into an overburdened socket. The sprinklers are triggered, and the room is soon awash, covering floors and desktops with water. Suddenly, singer Jonathan Michael – still seated behind his desk – begins to advance toward the camera, as if drawn forward by a magnet. Intense, eyes blazing, he hurls his lines at the listener; then, without warning, he breaks a fourth wall and he’s out on a suburban street. When the group returns to this office later in the clip, they’ll tear it up even further, pounding out their contempt for the sterile environment. Of course, there’s plenty of live footage, too. 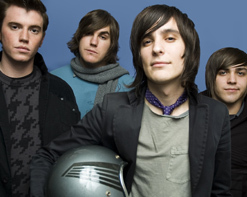 While young, this Sacramento quintet is road-tested: they’ve toured with The Starting Line, Boys Like Girls and Houston Calls, and they’ll continue their travels across America during the balance of 2007. In the “Becoming A Monster” video, Self Against City plays on a semi-arid hilltop; leafless desert trees reaching toward the sky behind them. The performance energy of the bandmembers is undeniable; particularly the animated Michael, who swings his microphone around, cups it between his hands, and shouts into it with astonishing vigor. And then he disappears, right through a doorway in the greenery. The camera pans back, and he and the rest of the band are in individual closets in a suburban bedroom, singing and playing under incandescent bulbs. Then that, too, falls away, and we’re right back in the office; papers flying across the room as the musicians tear apart the furniture with crowbars. There’s a sense of impermanence and instability to everything they encounter; it’s as if every wall hides a secret, and every solid surface is poised to give way and morph into something completely different. The clue to what’s going on rests on Michael ’s desk. There, on top of a green hardcover and next to a standing picture-frame is an old Viewmaster. These settings change suddenly, just as images do when you’re looking through the eye-piece of the toy. Of course, that leaves open the biggest question of all: whose thumb is on the Viewmaster lever? We are thrilled to once again be working with Kristine Ripley, Ana Bustilloz and all of the fantastic crew at Drive Thru Records. As always, they have hooked us up with plenty of copies of Self Against City’s new record Telling Secrets To Strangers for all of your on-air giveaway needs, so don’t hesitate to be in touch if you’d like to score some! If you need more info call Andy Gesner at 732-613-1779, or email info@HIPVideoPromo.com.